There's something so old world about candied fruits. I'm thinking of this article which appeared in the New York Times waaaay back in the day. The article is mostly about the heavily sugared fruits confits glaces so popular around Christmas. When passed around a celebratory table along with the other treize desserts or 13 regional delicacies, in the south of France they represent the gifts of the three wise men. Candied fruits also play a part in traditional Chinese New Year celebrations. Served in a round or octagonal chyuhn happ or"tray of togetherness," each candied fruit represents something different. The Food Museum Online provides a brief description of the tray and its contents. Where candying entire fruits can take a month if done the traditional Provencal way, candying just the peel is only an afternoon project. I find candied fruit peels charming in an almost aristocratic way. They beg to be nibbled with pinky raised, their mild tartness tempered by the sugar. Not exactly R's (we're now calling the fiance "R") first choice in a dessert. But when he asked what I was making and I answered "candied grapefruit peels" he just looked at me blankly for a split second and then said "okay, well candy sounds good, no matter what you said after that." The Woman's Day Encyclopedia of Cookery provides a recipe very close to the one I use bellow. 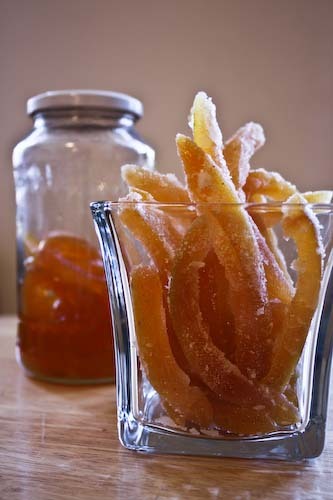 In Regan Daley's wonderful In the Sweet Kitchen: The Definitive Baker's Companion she provides a recipe for candied citrus peel, giving variations for orange and grapefruit. Although I can't fine them now, I could have sworn that I've seen recipes for candied citrus peel that didn't call for a three-part blanching. But this step is what causes the peel to release it's bitterness, and in addition to In the Sweet Kitchen, both The Joy of Cooking and Woman's Day Encyclopedia of Cookery recommend it. I'm providing instructions for both a dried peel rolled in sugar and a wet peel stored in its poaching liquid. 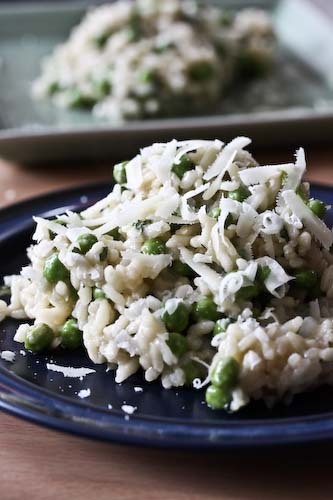 As Daley said, the recipe is generous, so you have more than enough to make it both ways. One more point about making these, although neither Joy nor Woman's Day give explicit instructions for how to remove the pulp from the pith, Daley suggests scraping the pith with a teaspoon or grapefruit spoon to clean it. I found it much easier, if you are willing to use your hands, to simply loosen the membrane on one side of the quartered and juiced fruit and peel it away from the pith in one large piece (see photograph). Cut the grapefruit in quarters and juice them. Hold on to the juice for another use, something like this one. With your hands, start on one end of the grapefruit quarter and begin pulling up on the pulp. The membrane should begin to let go of the pith and you should be able to pull the whole thing out in one chunk (see picture). 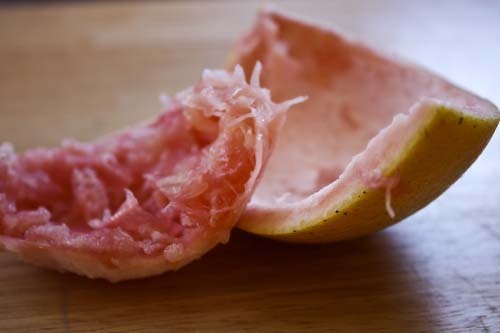 If there's plup or membrane left on, you can use a grapefruit spoon to scrape it off. You should be left with a nice clean pith and peel. Cut the grapefruit peel into 1/4 inch strips. I found it was easiest to do this with a serrated knife, with the peel site facing up. Fill a 2-quart sauce pan with water and bring the water to a boil. Simmer the peel for 5 minutes, then drain. Re-fill the pan with fresh water, return to a boil, and add the peel back in, simmering for 5 minutes again. You want to do this for a total of three times so that the grapefruit peel will loose its bitterness. 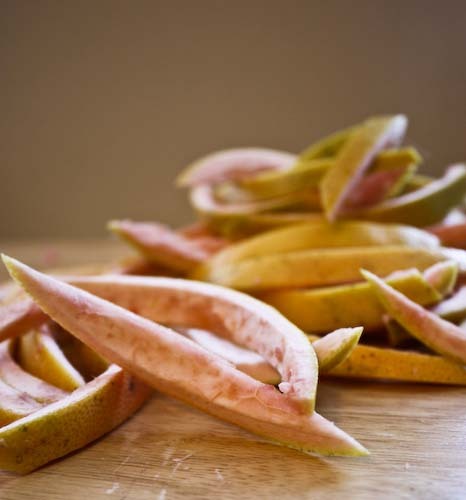 Once you have boiled the peels for the third time, combine the 2 1/4 cups sugar with 1 1/2 cups water in the same sauce pan. Over medium-low heat, stir the mixture until the sugar dissolves completely, then add the peel back in. Brush down the sides of the pan with a pastry brush dipped in cold water so that the simple syrup doesn't burn. Return the peels to the water, increase the heat so that the liquid comes to a gentle boil then reduce the heat to a simmer. Simmer the peels for between 1 and 1 1/2 hours, until they are very tender and sweet and the liquid has been reduced to a syrup. Cool the peels in their syrup until lukewarm, transfer to a clean container and store, covered in the refrigerator. 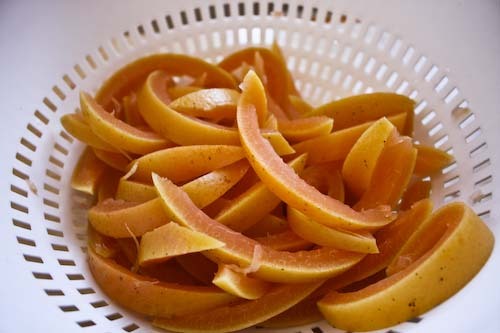 The peels in syrup are a beautiful jewel-tone, and would be perfect as a garnish over a sponge or cake, baked into muffins or breads, or spooned over ice cream. 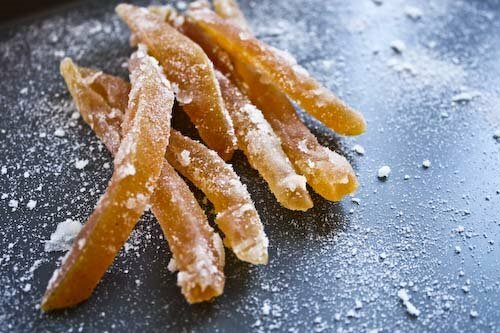 Spread 1 cup of sugar on a cookie sheet and put the peels directly from the syrup onto the sugared tray. Roll the strips in the sugar until they are well coated. Place a cooling rack over another tray and as each strip is rolled in the sugar, place it on the cooling rack. The peels should not be touching so there is enough room for air to circulate around each one. Leave in a safe, dry place overnight until the peels are dried out. You can store the peels layered between parchment paper in a sealed container. I adore candied citrus and grapefruit is my all time favorite. These look fantastic! I can't wait to make them too! this is interesting. 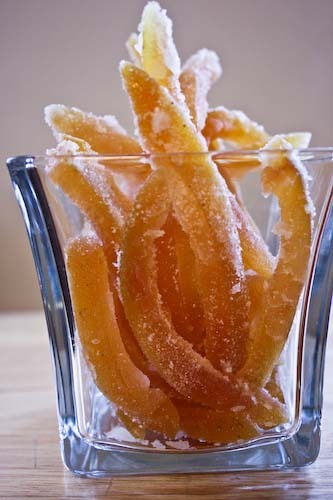 I already made some candied peel with orange bu tnever tried grapefruit. Surely they re better than the storebought ones which taste of nothing. How long do you think they ll keep? They look delicious! I'm curious too about how long they'll keep? Hi Zoe, I'm a complete grapefruit fan as well! Snooky Doodle and Lisa, she doesn't say how long they'll keep, but they are lasting quite a while. They're not gone yet and I supposed that because their natural moisture is mostly replaced with the sugar syrup they'll be fine for a while! I've been wanting to make these for the holidays for years now, but never gotten time during the usual craziness of December. But you've inspired me. These look sooooo good. A friend has made them with orange and then dipped them in chocolate. Yum. Can't wait to try them. I love all things grapefruit. I am making these for the 2nd time using your recipe. I finish them off overnight in my dehydrating oven and then dip them in dark Ghiradelli chocolate (60% or darker) once they are completely dry. Heavenly! I found the sugar coating way too sweet. I made these to use in biscotti and they turned out perfect (not the biscotti, that will be in a day or two), thank you for the great recipe, my eleven year old likes them too!